Aly Dosdall: what will your legacy be? Recently I had the chance to think about legacies, and what we leave behind for those we love. You see, as a scrapbooker that's something that crosses my mind once in a while. I want to make sure that I'm leaving a legacy through my memory keeping. It helps focus my scrapbooking goals and efforts, and guides my decisions about what memories to record and how I record them. We can leave legacies for those we love through many means--not just scrapbooking. On Sunday I saw a perfect example of that as my mom and dad arrived at our house for a family dinner. My mom presented my youngest daughter with her "grandma blankie". 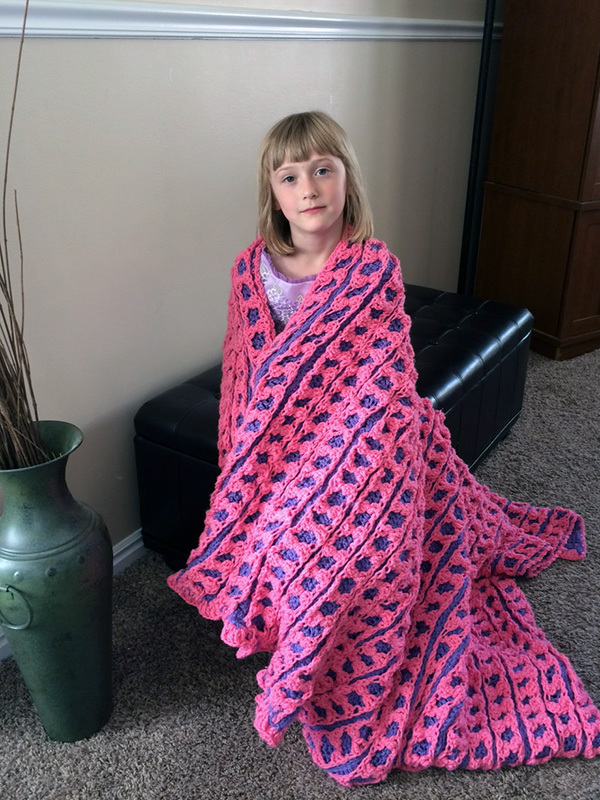 For two decades now my mom has been working on "grandma blankies" for all of her grandkids. She meets with each of her grandchildren and shows them pattern books so they can pick out the afghan they want. Then she lovingly crochets each one, sews on a custom label, and presents them to her grandkids. These precious gifts not only remind the grandkids of grandma right now, but once grandma is gone they will serve as a legacy of love and sacrifice that will help us all remember the kind of person she was. They will help us want to be better because we knew her. Our legacies don't have to be something crafty, or even something physical. They can be legacies of time, love, listening, helping, teaching, forgiving or anything else that is unique to us and our relationships with those we love. What's most important is that we are purposeful and intentional in planning and leaving our legacies. That's the best gift we can give to our loved ones.